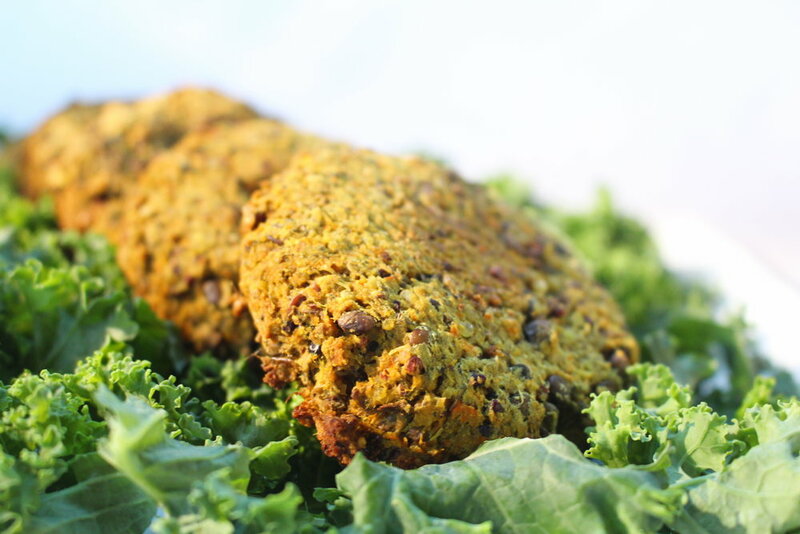 Lentil burgers with tricolor quinoa is truly the closest thing to real burger flavor. (instead of buying ready-made ones). The only difference is that with these ones, you know what's in it and it isn't processed. You control the amount of sodium and the freshness of the ingredients. By adding fresh vegetables and tahini sauce, you have a complete nutritious meal that is satisfying and delicious. In a non stick pan sauté the onion with olive oil, salt, pepper - until golden and tender. Let it cool. In a bowl add the cooked lentils, cooked quinoa, carrots, turmeric,cumin,hemp seeds, flaxseeds, falxseed meal and the sautéed onions. Mix well together. Take a hand blender, and blend about half of the mixture in the same bowl. Take a baking sheet and spray with olive oil. Use and ice cream scooper to create evenly sized patties, and shape it with your hands. Spray the burgers with olive oil and bake for 20-25 minutes until golden brown. Let it stand for 5 minutes before serving. Eat with your favorite bun and veggies. I like to serve it with tahini sauce.